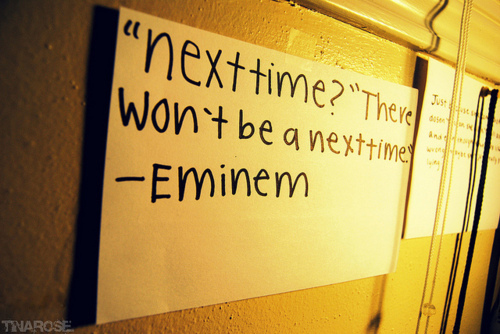 Next time? That doesn’t exist. Where did the Summer go? It’s almost the 1st day of August. Sheesh, time is flying. I enjoy having my Summers off to focus on personal projects, rest and recalibrate my vision. I love it because I have my TIME and with my time I can do things to increase my VALUE. Think about this…If you have a 9-5 job, you exchange your time for money. Have you ever stopped to consider that your employer determines how much you are worth? If I make $10.15 an hour, that means I’m valued by my manager at $10.15. If I was worth more to that company, I would be PAID more. Now you might be saying hey, I’m worth more than that, and I will be the first to say ABSOLUTELY. We all are worth FAR more than what we are paid. On a biological level, the human body is worth billions of dollars. What determines your worth is not your potential, but how much time you invested into maximizing your potential! You know many people have lost their jobs during this economic recession, but my question to them is “How are you using this time to INCREASE your value?” I believe that this recession is one of the best things that could have happened to some of us. We have been cuddled into resting in a false security called a “J.O.B.” that leaves us Just Over Broke while God is giving us the gift of TIME to refocus on the DREAMS He had already given us to fulfill! Within the past year and a half, I’ve discovered a few secrets about time. Time management is one of the greatest secrets to living a purposeful life. Ever felt like there’s not enough time in the day to get everything done? You’ve been trying to finish that degree but didn’t feel like there’s not enough time. You wanted to learn a skill, but felt there was not enough time. That’s one of the most common statements made by a person who doesn’t use time wisely. Unlike metals, plastics and paper, you cannot recycle time. Lost time is never found again. Studying the stories and lifestyles of some of the most successful people on the Earth, I’ve realized that the way they used their time is really one of the defining factors to their success. Everyone has the same 24 hours, 1,440 minutes and 86,400 seconds in a day. Those who MASTER their time, master their lives! You must govern the clock, not be governed by it. NFL Hall of Fame wide receiver Jerry Rice stated “Today I will do what others won’t, so tomorrow I can do what others can’t.” Things are speeding up. I feel in my spirit that August will be a month of acceleration for those who are willing to prepare for what God has prepared for them. The future is not in your tomorrow. The future is NOW. Here’s some tips to prepare for it. Invest in YOU this month. Find and read books, pay for seminars, go to conferences, take classes etc. relating to the vision God has placed in your heart. Many people are generously sharing information to help you help yourself. Add value to yourself by finding ways you can add value to others. How can the idea you have bring value to those around you? Design your plan. Remember, people PAY for the value you offer. Get a planner/daily organizer. Challenge YOURSELF to make a list of 3-5 things that you know you MUST do the following day. That way you hold yourself accountable to your own personal goals. My personal goals for example are to finish my next e-book, build my new ministry website, get my paperback books for The Jesus Mind published and build my overall brand. Each day, I have a goal in mind as to what actual step I will take to accomplish those goals. After a while, the above mentioned list will become a habit of success for you! Remember, you’re not worth what you’re paid. Your worth is determined by the value you create with your time! Spend it wisely! Awesome words! Thanks for posting. This is definitely confirmation for me. I know I have been given time to accomplish goals the Lord has placed in my heart. It would be foolish of me not to maximize my time to reach my goals and reach my full potential in Christ. Thank You! Blessings. Go for it! Don’t put off until tomorrow what can be done today.